The Armored Group (TAG) is proud to announce the launch of their new Ballistic Armored Tactical Transport (BATT). The BATT was developed to provide unequalled safety features and tactical capabilities in the field for deployment, extraction and medic services. The Armored Group’s BATT vehicles offer the highest level of personal protection, unmatched comfort and interior space for personnel and storage. It features extra-large custom rear door design with 90-degree lockout providing added protection and shooting space along with added entry/deployment capabilities. The Armored Group’s BATT offers more road enhancements such as shocks, tires and rims making it adaptable for rural and urban use in a variety of weather, environments and terrains. Because the BATT features state-of-the-art armoring processes, the vehicles are able to protect against NIJ IV/B7 Level threats, including but not limited to the .30.06 AP Round, .50 Caliber Ball Round ammunition and blast-type threats. Curved Side Walls have been specifically bent/contoured to encompass officers in full tactical gear. 141″ Wheelbase that is not cut down, but built to fit the existing OEM platform. Flip-Up Rescue Seat is a custom designed passenger seat that flips up out of the way to allow officer entry/exit through the passenger side front door. This allows officers the ability to deploy out the side of the BATT, instead of limiting them to the rear of the unit. This incorporated feature lets the team keep maximum seating ability, does not require cutting additional doors in the unit and is a standard feature on BATT and BATT S AP vehicles. Flip-Out Running Boards adds 6” of extra footing when deployed providing more stable and safe footing and enables teams to enter/exit a scenario quickly and safely. The flip board folds on top of itself when not needed, and stays within the width of the widest part of the vehicle. Rear double-drop step and officer platform reducing chance of injury. When rear doors are locked out at 90-degrees, an officer can be fully covered between the doors on the step, allowing the BATT to extend its armor to protect more personnel. Allows technology integrations such as back-up, thermal and robotic cameras. Controls HVAC Systems and emergency lighting. Contains multiple media ports and computer inputs. Adaptable to EMS equipment and software enhancements. Lockable in multiple locations, includes an optic-ready gun port, and provides NIJ IV/B7 .50 Caliber Ball Ammo protection. Includes a multiple height, flush in floor mounted sniper step. Uses Minimal Pieces to increase overall protection—1-piece side walls, floor and roof. Curved wall opens up rear officer area to allow room for TEMS personnel to attend to wounded officers/civilians while still in an active shooter/hostile situation. BATT design allows medics to work on a wounded person, while still being able to sit a team. Rear platform with wide rear doors allows easy entry/exit. Extra-large designed passenger door to allow easy entry/exit. Locked out doors allow officers on running boards added armor protection. Use ½” mil spec steel for walls, turret lid and doors. One piece side walls, floor and roof. Fully armored firewall to help protect against frontal incursions. Gap protection at all doors and turret lid to increase protection and reduce risk of bullet penetration. Lock-out doors to increase ballistic coverage; front doors at full open and 45-degrees; rear doors at full open and 90-degrees. All materials certified by third party experts like HP White and Dayton Laboratories. 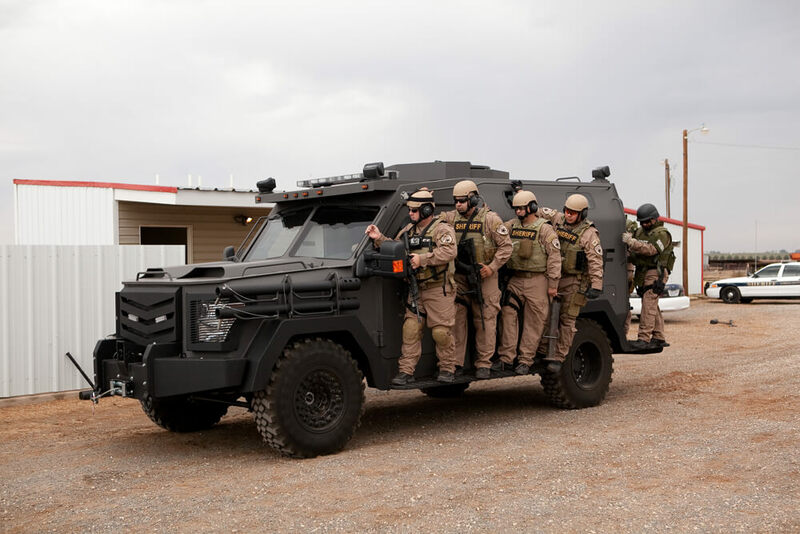 The BATT family of armored personnel carriers has more tactical advantages built into the vehicle than any other unit on the market, offering the safest, most upgradeable and versatile armored vehicle platform specifically designed for law enforcement, rescue and certain military operations. 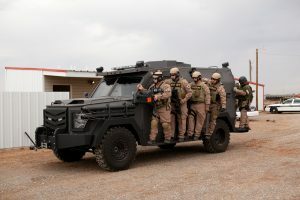 For agencies that require larger vehicles, The Armored Group offers the BATT XL, which has the ability to carry over 15 fully geared officers. Also available is the BATT S NIJ III Edition which was designed for departments requiring rifle round armor at an affordable starting price. The BATT S NIJ III Editions are priced less than the cost of up-fitting older Peacekeepers and bring with it new armor, a new chassis, updated tactical abilities, and full factory warranties. TAG also offers the BATT S AP, which is a preferred vehicle of many law enforcement agencies due to its exceptional protection and value. TAG also has a complete non-armored specialty division that builds units for warrants/raids (i.e. our NTAO Tested and Recommended RDV), Hostage Negotiators, EOD, Command Centers, Crime Scene, Equipment trucks, etc. The Armored Group (TAG) has over 20 years of experience engineering, manufacturing and modifying armored vehicles for use by government military agencies, law enforcement, private businesses and individual citizens around the world. TAG will engineer, design, build or modify tactical armored vehicles for any terrain and any environment. They specialize in three categories of armored vehicles: armored personnel carriers, personal protection vehicles and cash-in-transit vehicles. For more information, please visit these company websites: www.armoredcars.com and www.swat-vehicles.com or call: 1 888-997-5607 or 602 840 2271.